China's Tiangong-1 space station is expected to reenter the Earth's atmosphere sometime in mid March, according to the California nonprofit organization The Aerospace Corporation. But its fiery return to Earth is not expected to pose any threat to people or land. According to data prepared and posted by the nonprofit, the Tiangong-1, or "Heavenly Palace" space station, was the site of many milestones in China's manned space program. They include the first manual docking between two Chinese spacecraft, and the first flight of a female Chinese astronaut, both in 2012. The station was also the site of the first on-orbit maintenance completed by Chinese astronauts, and a 15-day mission into space, with 13 of those spent at the station. In March of 2016, an official Chinese statement declared that telemetry services with Tiangong-1 had ceased. 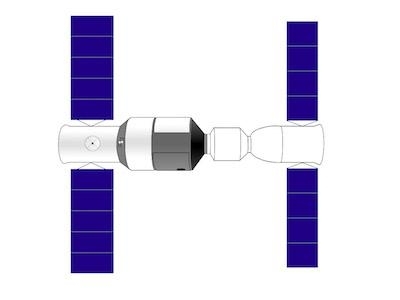 Based on The Aerospace Corporation’s analysis of Two-Line Element set data from the JSpOC, the last orbital adjustment for Tiangong-1 was made in December 2015. Likewise, amateur satellite trackers have been tracking Tiangong-1 and claim it has been orbiting uncontrolled since at least June 2016. On September 14, 2016, China made an official statement that they predicted Tiangong-1 will reenter the atmosphere in the latter half of 2017. It was not mentioned whether the reentry was controlled or uncontrolled. The reentry is expected to be "uncontrolled", which means there is no guarantee about where the spacecraft will reenter the atmosphere and where any surviving pieces might fall to Earth. However, The Aerospace Corporation projects that based on Tiangong-1’s inclination, they can confidently say that this object will reenter somewhere between 43° North and 43° South latitudes. Quartz Media reports that those coordinates would have the spacecraft reentering largely over the ocean, though it could traverse the U.S., Brazil and China as it falls to Earth. The Aerospace Corporation warns that there may be a highly toxic and corrosive substance called hydrazine on board the spacecraft that could survive reentry. For your safety, do not touch any debris you may find on the ground nor inhale vapors it may emit.